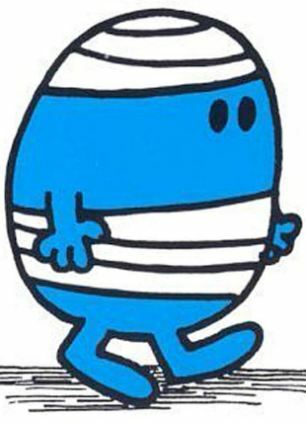 Meet Britain’s real-life Mr Bump: The man who’s had 34 operations, broken 15 bones and survived a heart attack and kidney failure | Mail Online. 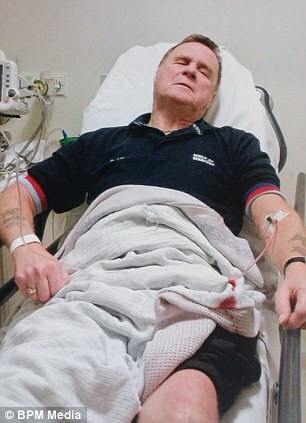 Britain’s unluckiest patient Terry Butler is a real-life Mr Bump, having had having 34 operations, a heart attack, kidney failure and breaking 15 bones in his body. The 67-year-old has also undergone a staggering six hip replacements and two shoulder operations, as well as breaking bones in his wrist, fingers, arm and knee. Since he was first admitted to hospital when he was a teenager he has spent the equivalent of 15 months of his life lying in a hospital bed. 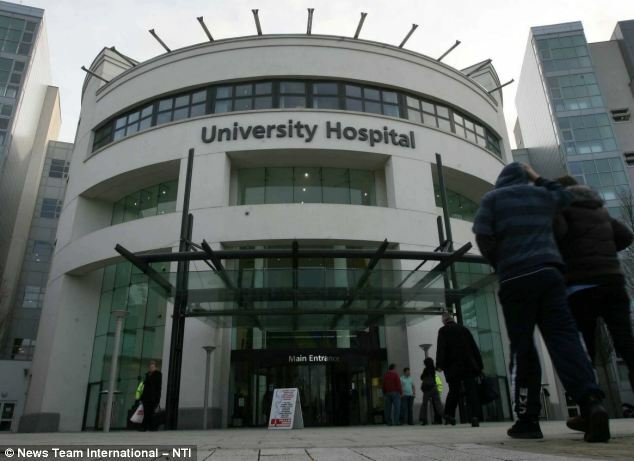 Terry even handed over a trophy to thank nurses at University Hospital Coventry, for devoting so much time to him before Christmas. 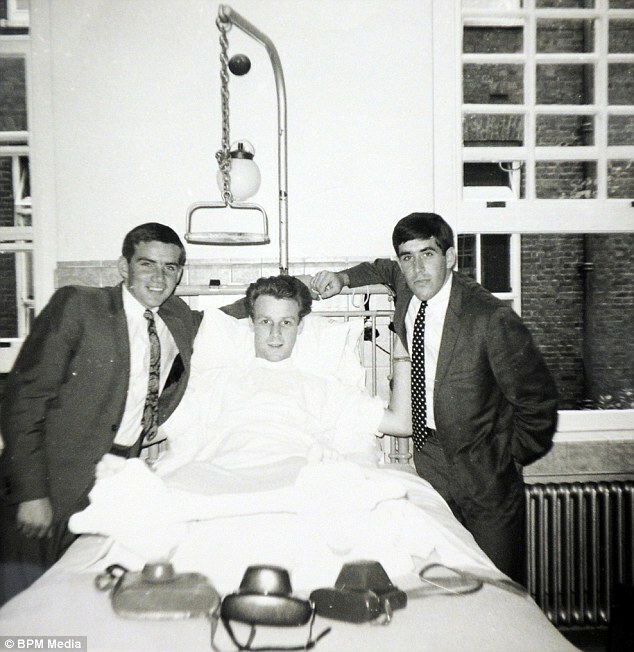 But the former Coventry City FC steward was back on the ward three days later after slipping in the shower and breaking his knee in three places. He was first referred to hospital with hip problems when he was just 18. Nearly 50 years later Terry, who has 14 grandchildren and two great-grandchildren, has notched up an astonishing 34 operations – 21 which were ‘major’ including three in just 10 days. The resilient pensioner even survived a heart attack on the operating table, two haemorrhages, kidney failure and nearly lost his leg after contracting a deadly infection weeks after being discharged. Despite his bad luck, Terry says he is determined to look on the bright side. Speaking at his home in Walsgrave, Coventry, where he lives with his wife Marion, 59, he said: ‘I have dodged the bullet a few times. ‘The nurses told me I’m an inspiration as I have always been a happy sort of bloke and got on with it. I just call myself unfortunate. I think I must the unluckiest patient in Britain. ‘Whenever I get myself fit I seem to either fall over or break something or get an infection and I’m back on the ward. ‘I’ve fallen in the shower, broken my hand when I slipped on wet leaves and almost died on the operating table more times than I remember. ‘My wife says they should have a bed permanently made up for me at the hospital. Terry was the youngest person ever to have a hip replacement when he was just 20, after being born with a bone condition. In 1990 he had further hip treatment but fell and broke his wrist shortly after his first consultation while walking to the shops. After his fourth hip replacement, he developed a devastating infection that left him with six weeping holes in the outside of his hip and nearly cost him a leg after contracting a deadly infection. He then needed three major operations in just ten days and for the last eight years he has need hospital treatment every few months. He had his last (and sixth) hip replacement six years ago when surgeons removed his entire left hip and part of his pelvis. To top it off, he’s even survived a heart attack on the operating table, two haemorrhages and kidney failure. 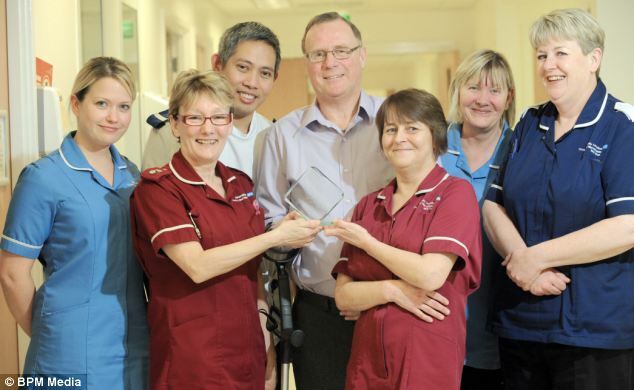 Last month Terry returned to University Hospital in Coventry to present nurses with a trophy. But a three days later he was back in hospital after slipping in the shower and breaking his knee in three places. ‘I know all the nurses by their first names and feel like I’ve we’ve almost grown up together over the years. Terry was born with a swollen left hip, but it wasn’t until he began suffering pains as a young footballer that he was diagnosed with Perthes disease. 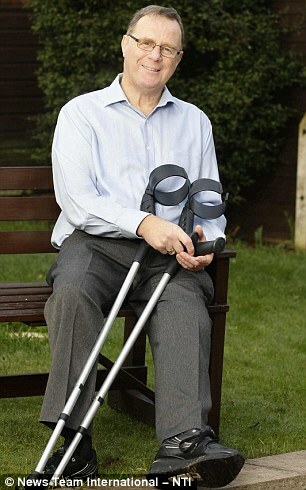 The condition causes the top of his thigh bone to break down and he became the youngest person ever to have a hip replacement at the Manor House hospital in London in 1966 when he was just 20. 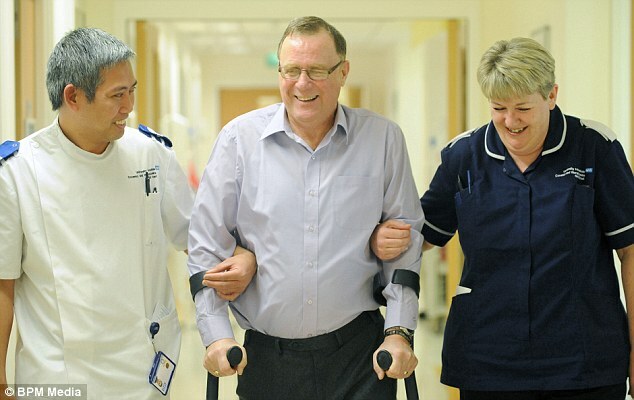 In 1990 Terry was referred to a hospital in Wigan for further hip treatment but fell and broke his wrist shortly after his first consultation while walking to the shops. 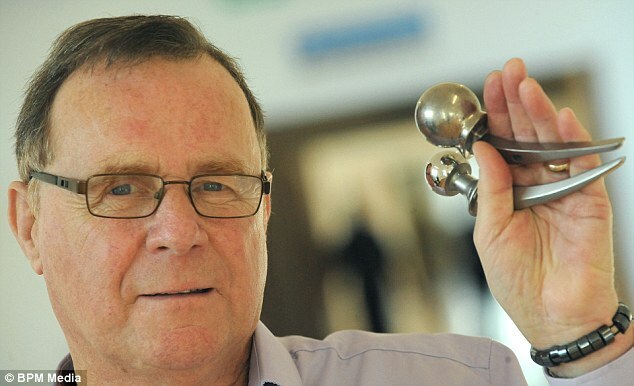 A surgeon in Coventry took over his care but after Terry’s fourth hip replacement, he developed a devastating infection that left him with six weeping holes in the outside of his hip. Remarkably, he needed three major operations in just ten days and for the last eight years Terry has need hospital treatment every few months. 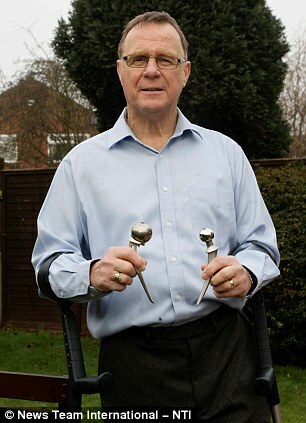 He had his last hip replacement six years ago when surgeons removed his entire left hip and part of his pelvis. Last month Terry returned to University Hospital in Coventry to present nurses with a trophy – which was inscribed with the words ‘Angels of Ward 52’. But a three days later he was back in hospital after slipping in the shower and breaking his knee in three places. Terry now faces an anxious wait to see whether his knee heals otherwise he faces yet another operation. He added: ‘I told the nurses I had come back for my Christmas dinner. The staff have been exceptional. They have always been there for me. ‘I used to be a dressing room steward at the Sky Blues. I got to meet all the greats like George Best and Bobby Charlton. ‘Some days I could hardly put one leg before the other but I went because it took my mind off things.